Topics: Branches, Credit Application, & Suppliers. 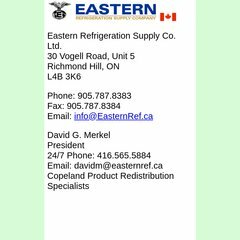 easternref.ca EASTERN | Refrigeration Supply Company - Toronto, CANADA. Its IP Number is 209.250.128.44. It has 2 DNS records, dns02.tor.axxent.ca, & dns01.tor.axxent.ca. It is hosted by Pathway Communications (Ontario, Buttonville,) using Apache web server. PING www. (209.250.128.44) 56(84) bytes of data. A time of 23.9 ms, is recorded in a ping test.